Did you realise that Hero Quest is over 25 years old, and it has never been revised or re-released. Yes, there is Advanced Hero Quest. And yes, there is that Gamezone ‘HeroQuest’. But the base, regular, standard Hero Quest has remained the same for over a quarter of a century. That’s 25 years of the same rules. Those that work great, those that work not-so-great, and everything in between. Who wouldn’t love to see Hero Quest cleaned up for modern sensibilities, while still retaining those kernels that make the game what it is? We are all game designers here. Let’s do something about that. You have the chance to participate in the first, massive, unofficial, TGDA game design overhaul. 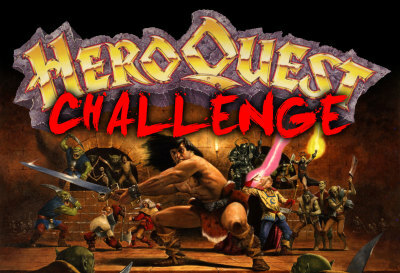 We are going to, as a group, play Hero Quest and talk about the game's strengths and weaknesses. Then propose changes, incorporate and test those changes we want to, and repeat the process. The ultimate goal? For individuals or groups to put together their own, new take on the Hero Quest rules and experience. There are no real rules or format for this exercise. I am going to give some goals to work towards, and a rough structure though, so we are all on the same page. The focus is the rules. Try not to introduce new physical elements into the game. Just use what comes in the box. Of course, no one is going to think any less of you if you add some new bits in. You can work in teams or individually. You can work in a team AND individually. Feel free to contribute to a team-produced rule set, as well as put together your own. We will discuss the positives and negatives of the game. Nothing about Hero Quest will be held sacred. Everything is up to scrutiny and critique. We will share our thoughts and solutions. This may (will) mean your ideas end up in other people's rule sets. Where you borrow or build on other people’s ideas try to credit them where appropriate. We will make whatever rule sets we produce available to all, so they can try out these new, home-brewed versions of Hero Quest themselves. You will have fun. It is required. We are all busy people, I get that. You have your own designs to work on! So this will be a leisurely six month exercise. During the exercise you can upload your rule sets to the WIP folder in the TGDA GoogleDrive, so people can have a look and give some feedback. After the six month period you can upload you can put together the ‘final’ rule set and upload it to the HQ Final folder in the TGDA GoogleDrive. After which the relevant TGDA page will point through to this area for everyone and anyone to download and try your rules. 01 Jan – 28 Feb: Find a copy of Hero Quest, and find those near you interested in playing. Familiarise yourself with the rules if necessary. 01 March – 31 August: Play, discuss, design, repeat. 01 September and onwards: Make the rules available.